Can you name the three BMW dealers that were in Washington State five years ago? If you said Ride West BMW, South Sound BMW and Mac's Cycle you would be correct. Can you name the seven that will be operating in Washington by the end of this year? In the last five years BMW has opened dealerships in Ferndale, Spokane and by years end we'll see shops in Lynnwood and Prosser as well. Things have changed inside of corporate BMW. Gone are the days of trying their darnedest to open single line dealers. Today the motorcycle division is content being in multi-line dealers and/or having a single line dealer expand into additional lines outside the brand. Such was the case we recently saw when South Sound BMW added the Ducati lineup to their showroom. 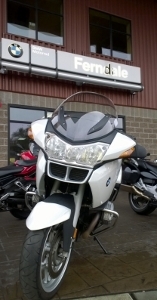 Above: A used white BMW R1200RT awaits a new buyer outside Pacific Northwest Motorcycles in Ferndale, Washington. But there are rules for everyone. You may have noticed construction going on inside any BMW dealers you've visited this fall. Corporate has mandated that all dealers will outfit their showrooms with pre-determined design aspects, fixtures and flooring. So where do the dealers purchase just the right flooring, fixtures and otherwise. BMW made that easy - they can only be purchased through BMW. It's a substantial 5-6 figure commitment per shop. To make it a little easier, some shops are being be co-oped on the purchase. Rule number two. Whatever floor space a shop allocates to the brand, no other product lines may be in the area. This goes beyond bikes to include clothing, parts and accessories. So if you want to compare the latest Rev-It jacket to the new BMW one, you'll have to walk across the showroom and find the non-BMW product to do your comparison. Back to the seven where there once was three issue. With more dealers and only a 7% sales increase for the year on the line, there will be lost sales at the existing three that will go to the other four. So how is this all going to pan out? For the last 13 decades there has always been a recession, or depression in the economy around the turn of each decade. Things got slow when we got to 2000 and this last one in 2008 was tough on everyone. If history is an indicator, this is the way things may play out. Prior to 2008 Kawasaki substantially enlarged their dealer footprint in the United States. But when the Great Recession took its toll, a number of shops closed their doors and the Kawasaki footprint in Washington State shrunk considerably. The chickens came home to roost. But in the meantime, BMW owners will have a lot of choices. The convenience factor of having seven dealers across the state will make it easier for BMW motorcycle owners, both locals and visiting riders, to access parts, accessories and service. It will no doubt build the brand statewide. If the economy tanks (and at some point it probably will) the footprint will likely shrink again. Dealers who share the same passion and marketing prowess that kept the original shops in business all these years will likely succeed, while those who just consider the brand another line in their store mix may have a hard haul.